The populated islands, such as Saltspring, Galiano, Thetis and South Pender Island can be reached by BC Ferries who operate a range of vehicle and passenger ferries between the Gulf Islands and to Nanaimo and Victoria on Vancouver Island and Vancouver on the mainland. Glacial ice shaped the landscape over 2 glacial periods. 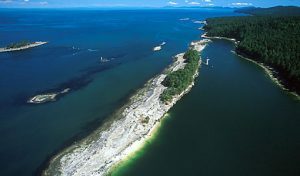 There are deposits of glacial sand and gravel which form Sidney Island and across all the islands there is evidence of glaciers with striated and fluted bedrock. There are some plants in the Gulf Islands which cannot be found anywhere else in Canada, most notably the Garry oaks and Arbutus trees. Most common across the Gulf Islands are the Douglas fir, Balsam fir and the famous Western red cedar forests. Sadly, much of the forest has disappeared, but look out for and enjoy the open wildflower meadows. For the locals there is a significant challenge to maintain these historical ecosystems as invasive plants such as gorse rampage over the islands. The islands are rich in nature with orcas, porpoises, sea lions, seals and otters in the sea and eagles, falcons and turkey vultures in the sky. On land, there have been problems with too many deer causing problems with the mix of forest plants. Captain George Vancouver made his first recordings of the Gulf Islands in 1792, although First Nations people were already living there. First Nations people identify themselves by the nation to which they belong. In Canada, it is usually aboriginal. In recognition of the original inhabitants, the Gulf Islands region is often referred to as the “Salish Sea”. Captain Vancouver claimed the islands for the British Crown, and referred to them as being located in a “gulf.” The islands aren’t in a gulf but the name has stuck. As marine traffic between Victoria and the Fraser River area exploded it became clear that a new map of the Strait of Georgia was needed and so in 1858-59, another cartographic expedition, on the HMS Plumper was dispatched and more accurate maps produced. Pioneers of this time had now already started establishing places to live on the islands. American blacks and Portuguese arrived and built farms in the valleys of the north end of Salt Spring. Hawaiians, who had been employed by the Hudson’s Bay Company or living in the San Juan Islands when they became U.S. territory in 1872 also developed homes on South Salt Spring and some of the nearby islands. Soon settlers from other parts of the world heard about the Gulf Islands and sought to make their homes there. By the mid-1850s gold fever had caught the attention of Canada. Miners Bay on Mayne Island became a bustling, lively port and one of the first Crown colonies. Not many years later, Salt Spring Island was engulfed by Australians, British and African Americans who were escaping slavery in the United States. Fruit orchards were developed and were hugely successful and evidence of these orchards can still be found. In 1872 the boundary between the United States and Canada was finally agreed and the Gulf Islands officially became part of Canada and the San Juan Islands part of the United States. 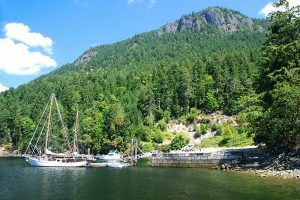 As you would expect, many of the islands, bays, harbours and viewpoints are named after Spanish and English explorers who arrived in the 18th century – Vesuvius Bay, Mayne Island, Plumper Sound etc. In recent years the preservation of aboriginal life has become more of interest and in the summer of 2016, male and female welcome poles were brought to the seaside at Burgoyne Bay Provincial Park by members of the Quw’utsun First Nation. There is a beautiful Japanese garden at Dinner Bay Park on Mayne Island and the Heiwa Garden in Peace Park on Salt Spring Island. Both of these gardens have been developed to acknowledge the contribution the Japanese made to the development of the Gulf Islands. More recently, Salt Spring boasts a restored charcoal kiln which was used by the Japanese pioneers. You’ll be sure to find on every island something of historical interest. South Pender Island – There is a challenging 1 hour hike at Mount Norman. The exercise will be worth the amazing views. Saturna Island – Go Geocaching and receive one of the limited edition Parks Canada geocoins. Geocaching is an interactive treasure hunt played with a GPS unit or smartphone. It means you get to explore areas of the island that you wouldn’t normally walk through. There are 2 geocaching loops, the Gulf Islands Survivor Challenge for a family-friendly series of treasure hunts and the Top Ten Challenge which is more advanced. Russell Island – book a kayak guide or water taxi and enjoy the forested trails that take you to the historic Hawaiian Homestead. 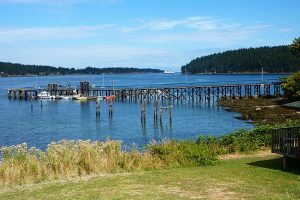 Pender Island – take the ferry to Pender and visit the museum where you will meet the locals and hear tall tales of the islands. Sidney Spit – whatever the weather, this picturesque area is sure to be a hit. A beautiful beach. North Pender Island, Portland Island, Prevost Island, Russell Island, Saturna Island – Go fruit picking in one of the many Victorian orchards. Pear, cherry, plum and walnut trees are the most widely planted. Apple orchards are the most common with enticing names such as Red Delicious, Golden Delicious, Spartan, Newton Wonder and Lemon Pippen. These islands are places of historical and natural beauty, but the bigger islands of Saturna, Sidney and Pender have a host of events going on throughout the year. For example, Saturna Island has a Sunset Wildlife Watch every Friday from 8 p.m. to 9 p.m. The meeting point is at East Point and participants bring blankets, chairs and flashlights and enjoy the talents of island musicians and storytellers. Sidney holds their Coast Salish Clam Garden Campfire in July and August. For thousands of years, Coast Salish people have harvested clams and other creatures at special beaches across the Salish Sea. Spend an evening listening to the stories of the locals about the clam gardens. 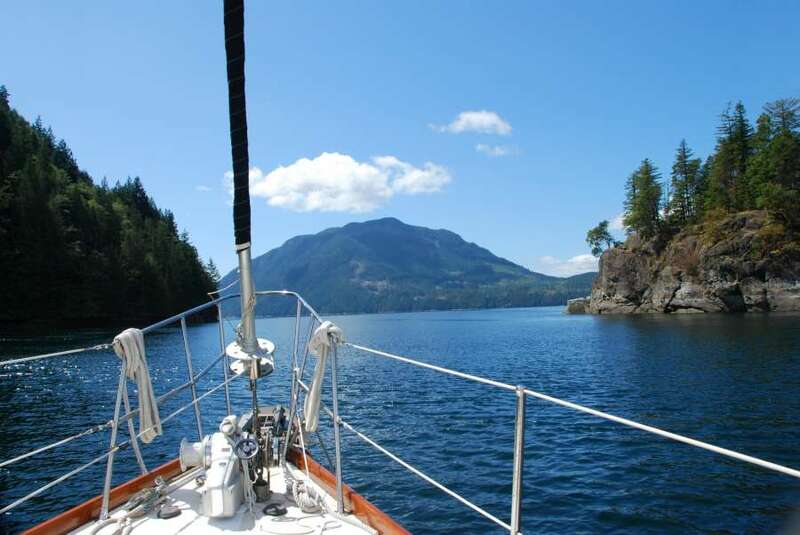 The Gulf Islands are a spectacular place to go cruising. By being on your own boat you have the luxury of deciding how long you want to visit each island and seeing nature from the sea at all times of the day. 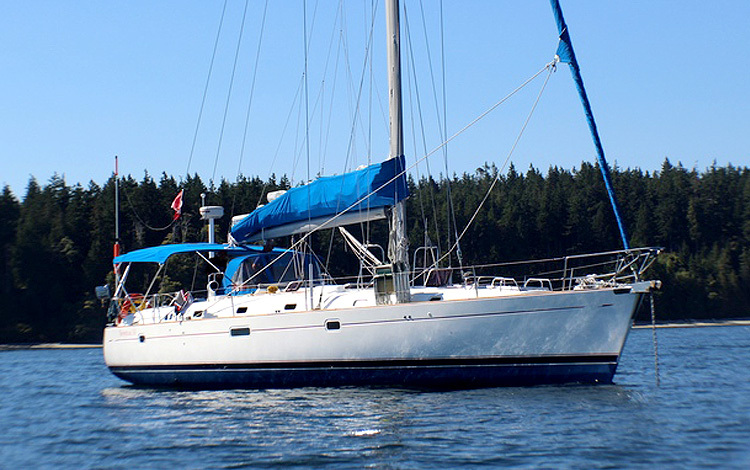 Spend some time cruising the Gulf Islands and don’t forget to tell us all about your adventure.